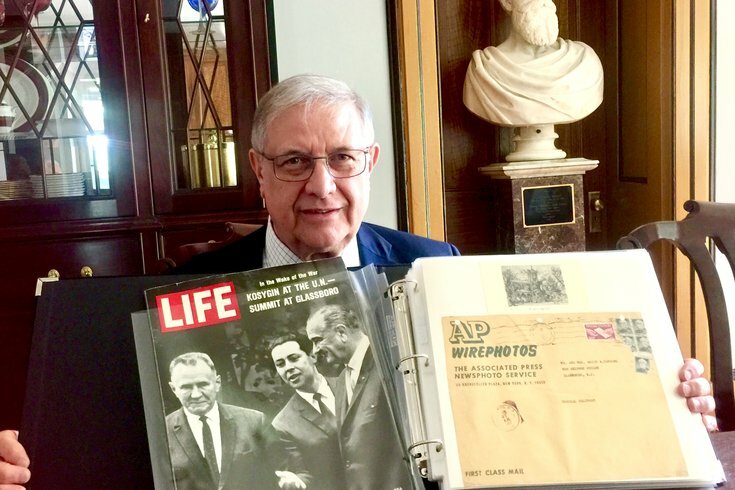 Nick Petroni became a film runner for the Associated Press when the Associated Press took over his parents' home for a newsroom to cover the Glassboro Summit in June 1967. Remember when the United States’ didn’t trust Russia? Nah, not last week. More than a half century ago, when we really didn’t trust them, and the threat of nuclear war was real. And while we’re no longer worried about Russian missiles based in Cuba, we are back in a period of mistrust. Which makes it a perfect time to recall – and celebrate – as Friday marks the 50th anniversary of the conference that helped ease Cold War tensions, the Glassboro Summit at Hollybush Mansion. 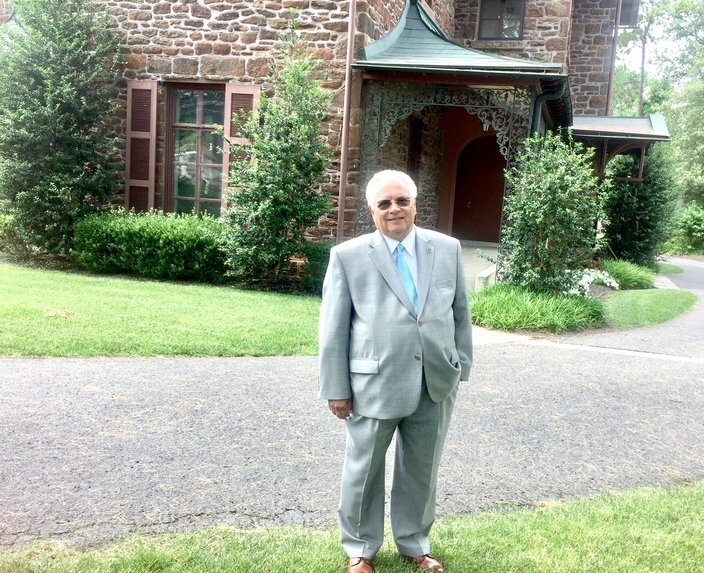 Hollybush, long the residence of the president of what was then Glassboro State College, was tapped to host the summit with 16 hours' notice, recalled Thomas Gallia, who was then a grad student at what was primarily a college for teachers. Now the retired vice president of what is now Rowan University, Gallia said Glassboro was chosen because it’s about midway between Washington, D. C., where Lyndon Johnson served as president, and New York, where Soviet Premier Alexei Kosygin was addressing the United Nations. New Jersey Gov. Richard Hughes had quietly lobbied for the location, Gallia added. Johnson flew to Philadelphia and then traveled via chopper to Glassboro for the conference. Kosygin was driven down the New Jersey Turnpike. Glassboro was a bit isolated, but not too isolated, a perfect place for the summit from June 23 to 25, 1967, said Gallia. While nothing formal came of the three-day meeting, Gallia said Hollybush set the stage for better relations at a time when the Israeli-Arab Six Day War was stoking hostilities. “They realized they could communicate, laugh and talk,” he said, showing off the room where the men met. Thomas Gallia, then a grad student, remembers being stopped and searched repeatedly by the Secret Service during the Glassboro summit. Retired from his post as vice president of the university, he's standing in front of Hollybush, where the leaders of the United State and Russia met and talked for three days. Nick Petroni grew up across the street. Early on the morning of June 22, an Associated Press reporter knocked on the family’s door. He asked to use the phone. And that’s how his home became the AP Glassboro bureau for three days, complete with a darkroom in the basement. Young Petroni spent the weekend relaying film back to his house for processing. His compensation was a U.S. Savings Bond. About 20,000 spectators crammed his street, many on his parent's lawn, he recalled. Photographs from the summit are here and here. 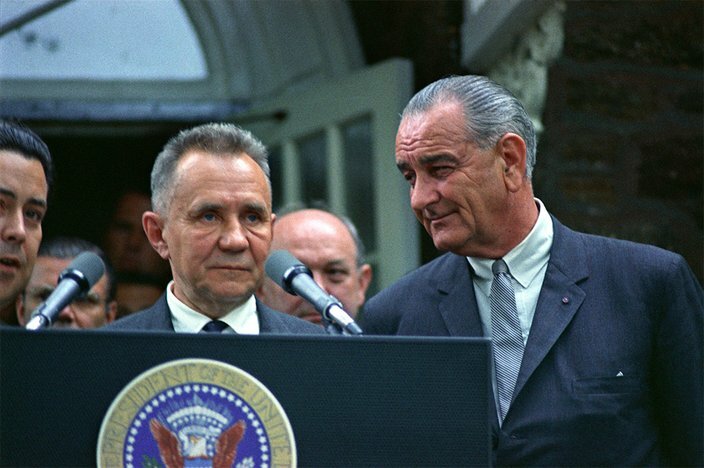 U.S. President Lyndon B. Johnson, right, with Soviet Premier Alexei Kosygin, during the Glassboro Summit in June 1967 at Hollybush Mansion on the campus of Glassboro State College. “My mom and dad did all they could to ensure that we met all the important people who were involved with the summit, but we were really just spectators, albeit with front row seats,” he said. A 50th commemoration ceremony is set for Saturday, June 24, from noon to 4 p.m. and then again from 6 to 9 p.m. at Hollybush Mansion, on Whitney Avenue, Glassboro, and nearby venues. •	Tours of Hollybush, the West Jersey Depot Museum, Heritage Glass Museum and Summit City Farm & Winery. •	Showing in the Edelman Planetarium of “10 Minutes to War,” about the solar flare that almost caused a nuclear war a few weeks before the Summit. •	Summit Stories, an opportunity for visitors to hear and record memories of the Summit. Events from 6 p.m. to 9 p.m.
•	The University and Borough will host the Summit 50th Celebration Dinner and Spirit of Hollybush Awards on the Hollybush lawn. The evening will feature 1960s-inspired food and entertainment and will honor people who have made major contributions to the university and the community.